On May 12, 2004, the second highest stakes poker game in history began at the Bellagio in Las Vegas. Andy Beal, a self-made billionaire, sat down across from Todd Brunson, the son of poker legend Doyle Brunson and a host of other professional players. Between them, $20 million lay on the table. It was an anomaly, particularly since most of the high-stakes games were being played on the internet at the time. Considering what was happening in the poker world and online, it looked like Beal might have been playing the swansong of the high-stakes casino poker game. 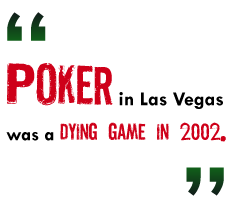 To understand the complex relationship between poker and the internet, the first thing you have to realize is poker in Las Vegas was a dying game in 2002. And, to understand why it was dying, you need to know how a casino makes its money. It all has to do with mathematics, and who is playing whom. In most casino games, the player is playing against the "house" - the casino itself. In these games, any time the player loses the casino wins the entire pot. So long as the casino can win at least 50.1 percent of the time, it can rake in a nice profit, particularly when several high-stakes gamblers are wagering thousands of dollars on each table. Even with lower-stakes games, the profit margin is still very high as long as the house can win more than half the time. In a game of poker, however, the house is not a player at all. The casino provides the dealer, the table, the cards and the chips, and for this Nevada law allows it to take 10 percent of each pot, and often the casino takes less. So, if $3,000 crosses a poker table in a single night, the house is only going to make $300 at most. And the casinos didn't like this. By 1995 poker was in decline. By 2003 most of the Vegas poker rooms had been shut down. But then two media came and saved the game from virtual extinction. The first was the World Poker Tour, which used little cameras to read hole cards and turn the game into exciting reality TV. The second was online poker, which allowed millions of WPT viewers try their hand at the game without from their armchair. And the game, while resuscitated, would never be the same again. Contrary to popular belief, poker is not a game of luck. It is a war against it, waged using psychology and mathematics. While random chance dictates what cards hit the table, every move and bet is used to minimize the impact of that chance. A good poker player must understand how to calculate the odds of his cards improving to the best hand, known as "the nuts," and then use that to determine what amount to bet. Once the player can do that, he can use that knowledge to read the other players' hand, based on their betting patterns and body language. The betting itself is a form of communication, as each player uses mathematics to manipulate the others, sometimes presenting the impression of a strong hand where none exists, sometimes drawing out the other players by portraying a weak hand while he has the nut. A skilled player can use this, as well as an understanding of body language and psychology, to make a fortune at the table.